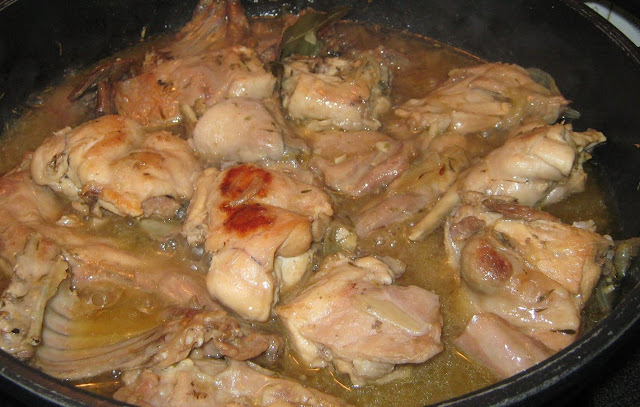 This recipe is a delicious tender casserole made of any game bird. All game birds are basically similar in their properties. The meat is generally fat free and can be rather tough. Therefore it is safe to follow the same basic cooking times for all. For older birds, increase the time and keep testing the meat. 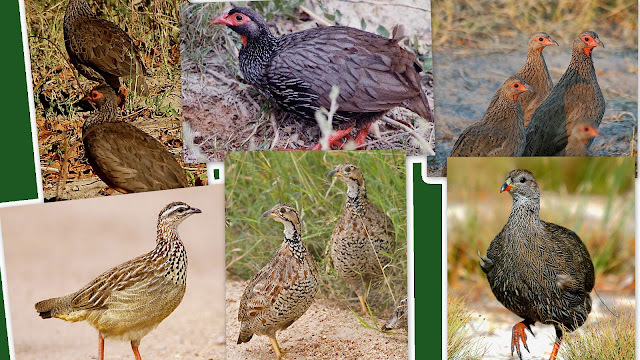 Francolin are fairly easy to hunt with an air rifle and can be found best in the evenings. Four pm onwards is best.Walk slowly and stop repeatedly through an area where they occur. When they see you they will often run, but will stop. Crested Francolin often fly into a thick bush and hide amongst the branches where they can be dispatched easily. The beauty of air rifle hunting is there is absolutely no stress the the birds or game because there are no crashing shotguns to traumatize every creature for miles around. for 4 people: 2 francolins. OR a guineafowl OR 8 doves OR similar weight in other game birds. You can leave the birds whole, but I generally chop them into 4 pieces. Two leg and thighs with part of the back and two breasts with a wing each. Then each guest can have a breast and a leg and thigh. Each portion has itsown unique flavors and texture. Heres how a chicken is quartered so you get the idea..
3 sprigs fresh rosemary chopped roughly. bunch of fresh basil chopped fine. pinch of thyme. fresh is best always. 2 bay leaves. Makesure they are fresh. If they have no smell and have been in the cupboard for years then sling them. Keep dried bay leaves in the freezer for freshness. dash of balsamic vinegar and quarter cup of good wine vinegar mixed. small glass of red red wine. 7 or 8 segments of garlic sliced and inserted into cuts in the pieces. Fiddly but worth it! Piece of butter for browning the meat. One large leek and half the green choppedor 3 or 4 small ones. half punnet of button mushrooms sliced. 2 cups of chicken stock. (Always try and keep the real thing in the freezer made by boiling leftover bones,skin, etc) Use cubes if you must but make sure it contains no msg. It is POISON! Insert the garlic pieces and wet them in the vinegar and red wine. brown the pieces well in the butter. Brown the onion and mushrooms well. Lay the pieces in a casserole dish and place all other ingredients around. Put the chopped herbs on top of the pieces. Carefully pour the wine around and add the chicken stock. Put the lid on and put it in a medium high oven for 3 hrs or more according to taste. (Some birds are tougher than others) Do not disturb the meat. You want to be able to carefully serve whole pieces when you plate your meals. Serve on Rice or a bed of couscous or mashed potato. Lovely recipe. You're so right about the bay leaves - it's so important that they're fresh. Thanks for stopping by my blog. It's actually a great and helpful piece of info. I am happy that you simply shared this useful information with us. Please stay us informed like this. Thank you for sharing.